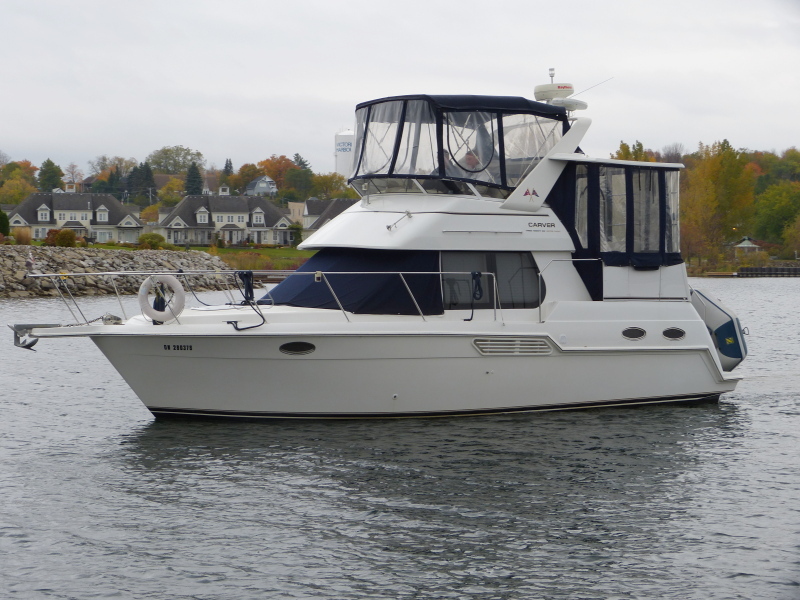 Carver’s 326 Aft Cabin MY offers a versatile layout that comfortably sleeps six with ample storage space for all aboard. The master stateroom features both double and single berths while the huge V-Berth sleeps two and the pull out sofa another two. The galley is well equipped with great storage and counter space. A fully enclosed flybridge and aft deck w/hard top offer wonderful extra space for entertaining out of the weather. Molded transom steps make for safe and easy access to the aft deck and swim platform. A huge, lockable storage box/seat on the swim platform will stow water toys for the whole family. Knowledgeable boaters will appreciate the Carver 326 solid fiberglass stringer system and solid fiberglass hull construction below the waterline – the two areas most prone to expensive structural problems in today’s production-built boats. This beautifully maintained freshwater vessel with very low hours will appeal to the most discriminating of purchasers!